Secondary property market sellers are under great pressure to lower their asking prices due to slowing sales said a research report by Knight Frank. The report which highlighted that secondary property market sellers are under great pressure referred to the URA Private Property Price Index which declined in Q1 2019, to arrive at their conclusion. The report said that prices of new projects were holding up in Q1, and that the decline in URA price indices was more reflective of the prices of completed properties transacted in the secondary market in Q1. It noted that the NUS Singapore Residential Price Index, which tracks prices of completed non-landed private homes and a proxy for the secondary property market, eased by 0.5% month-to-month after January’s 0.2% dip in price. The report which noted that secondary property market sellers are under great pressure to reduce prices, said secondary property market sale transactions in Q1 2019 dropped to 1,623 units from 2,165 units in Q4 2018. The report acknowledged that while not all the properties transacted Q1 2019 were recorded yet, it was unlikely the secondary property market sale transaction volume would exceed the 2,165 units transacted in Q4 2018. New sales declining more moderately than the secondary property market sales adds weight to the conclusion that secondary property market sellers are under great pressure to lower their asking prices. The report noted that new sales retreated by 7.4% q-o-q to 1,681 units in Q1 2019. Intuitively, the prices of the non-landed properties in Core Central Region (CCR) were expected to be more resilient than prices of those outside CCR, said the Knight Frank report. 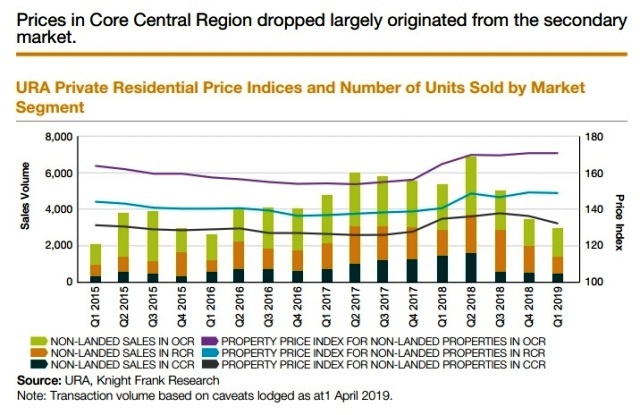 “Yet, the price index for CCR non-landed private residential properties declined by 2.9% q-o-q, and the price index for non-landed properties Outside Central Region (OCR) stayed flat. The price index for non-landed properties in the Rest of Central Region (RCR) also stayed largely unchanged, dipping marginally by 0.2% q-o-q. The prices of the non-landed properties in Core Central Region (CCR) were expected to be more resilient than prices of those outside CCR. In contrast, the fall in price index of non-residential properties in CCR probably emanated from the secondary property market sellers seeking to divest their properties urgently, said Knight Frank. The report noted that out of the new projects that were in the market in Q1, Treasure at Tampines sold the most in Q1 2019. The project sold 270 units at an average unit price of S$1,339 per sq ft. Separately, the announcement of the upcoming stations of the Cross-Island line boosted sales of developments that were in proximity to the upcoming stations, such as Affinity at Serangoon and Riverfront Residences, the report added. The Knight Frank report said that according to the top 5 selling projects, most of the buyers were acquiring units that have a floor area between 500 and 800 sq ft for less than S$1.1 million. It added that the residential status of the buyers of the top 5 projects were mainly Singaporeans, and that given that these projects were not within the CCR, they were less attractive to foreign buyers who had to fork out higher ABSD. Separately the rental markets stayed largely stable across all segments. The average rent for Ultra-luxury properties came down q-o-q in Q1 2019, but the decline was attributed to seasonality effects. The yields for the middle-end and mass market stayed compressed, but the yields for ultra-luxury apartments inched up in Q1 2019.
iCompareLoan is the best loans portal for home-seekers, buyers, investors and real estate agents alike in Singapore. On iCompareLoan, you will be able to find all the latest news and views, informational guides, bank lending rates and property buying trends, and research data and analysis. The post Secondary property market sellers under pressure to lower asking prices, Research appeared first on iCompareLoan Resources. This entry was posted in RSS - Property News and tagged RSS - Property News. Bookmark the permalink.